Medinova Medical Services Ltd! Hello Dear, welcome to Medinova Medical Services Ltd Location, Doctor List, Contact Number, Email and More Info content. In our country, there are many Hospital available, which provide good quality medical services. Today, we are going to share Medinova Medical Services Ltd Contact Number, Hospital Address, Doctor List, Helpline number for Appointment & Email Address. So, staying with us and follow the below content. MEDINOVA MEDICAL SERVICES LTD. an approved Medical Check-Up Center of the Executive Board of The Health Minister’s Council for G.C.C (Gulf Co-operation Council) States, bearing G.C.C Computer Code No. 05/01/24. 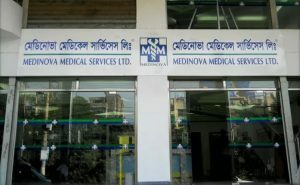 We are one of the member medical centre under GAMCA, Dhaka-Bangladesh. We are situated at the prime location of Dhaka city located at HOUSE # 71/A, ROAD # 5/A, DHANMONDI R/A, DHAKA – 1209. Organization: CMH and AFMC, Dhaka Cantonment. Thanks for staying with us a long time and visiting Medinova Medical Services Ltd Location, Doctor List, Contact Number, Email and More Info content. If you have any question about the Medinova Medical Services Ltd information? Just comment here, we reply as soon as possible.